If you want to be, or are a vegetarian, you wouldn’t want to miss out on this amazing vegetarian stew. If your children do not like eating vegetables or is there any specific vegetable that they avoid, you can just add it to this recipe and it will be a matter of time before you children will ask you to make it over and over again. So, what are you waiting for? Gather the ingredients and start making one of the healthiest and delicious vegetarian stews you have ever tasted. First of all, you need to take a skillet and drizzle olive oil in it. Place it over medium heat and sauté onions, mushrooms, garlic, sliced potatoes and carrots. Keep on stirring the vegetables until you find them fully coated and turning semi-tender. Their colour will also become more prominent at this point. Now you need to add in crushed tomatoes, along with vegetable stock, to the skillet. Sprinkle rosemary, salt and pepper to taste. Slightly increase the heat under the skillet and wait for the mixture to reach the boiling point, before reducing the heat once again. Simmer until vegetables are fork tender. 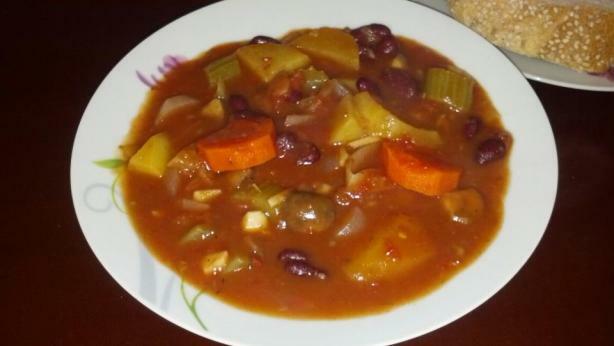 When vegetables are well cooked, add the beans to the stew (don't drain the beans). Cover and cook for an additional ten minutes. Stir often as the contents of the stew may eventually stick to the bottom of the pan and burn. When vegetarian stew is done, place it into a decorative bowl. Serve Italian bread with vegan butter. You can also put stew over rice or pasta for a hearty and filling meal.